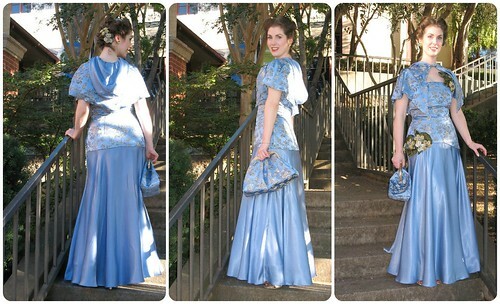 A few people noticed that my clutch disappeared from the final photos of my Gala Gown. Well, with the limited picture taking time, and a capelet to remove and put on again and again, I did not get that many pictures while holding the darn thing! Whoops! But I really did take it with me; and it was large enough to hold my (less than fabulous) camera, which was very helpful. 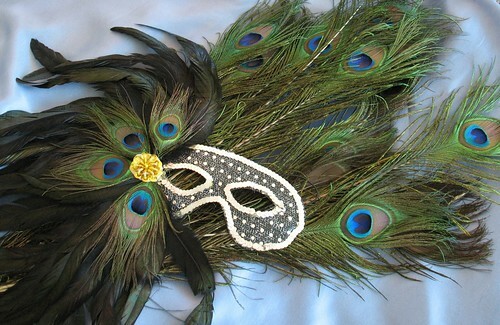 By the way, the theme for the Gala was Carnivale Italiano. Although I never had any specific intentions of matching the theme, I think it all worked out quite nicely. There were sequined masks and peacock feathers as centerpieces. I have to laugh at what magpies women can be - as soon as someone announced that everyone was welcome to take the decorations home, we all swooped in. No one else seemed to be interested in the peacock feathers, so I took a gaggle of them with me. I feel a project coming on . . .
And if you missed anything, here is what I have been doing for the past month! Now that I have stepped back from the project for a few days, I am wondering how I never managed to finish in time!? It has been an incredible journey. Thank you for all of your beautiful comments - it really is wonderful to feel appreciated! 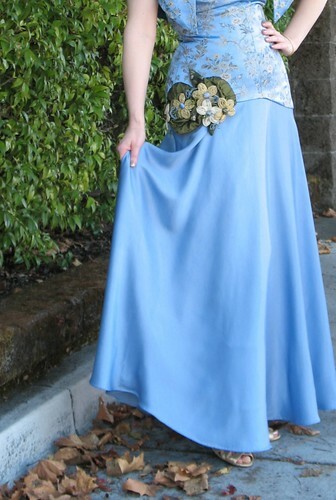 You look like a princess in this dress, truly wonderful. Your gown is so beautiful! I love the blue color! And such inspiration for making my little sister's wedding gown for her! Thanks for sharing the final pics with us! It is a gorgeous outfit! Your dress is beautiful. 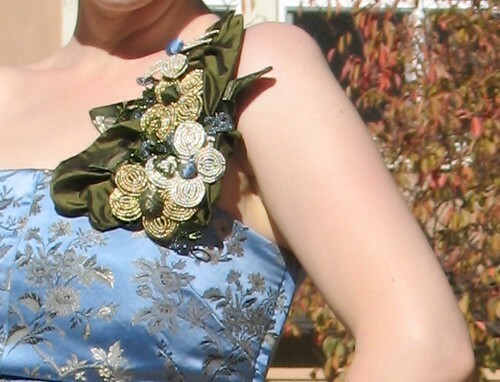 The embroidered fabric really made the dress. 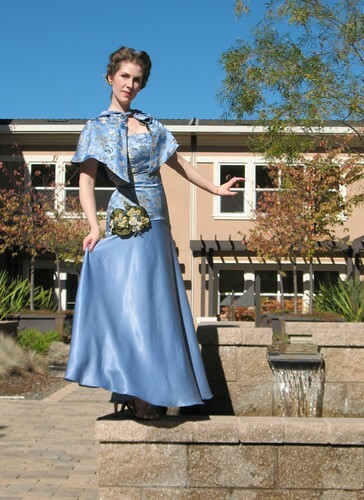 And the purse and capelet are a great finishing touch. I am in awe of your dress!! It is simply stunning. The hood I think is the best part of it! And I'm glad you shared pictures of the clutch! Equally amazing!! 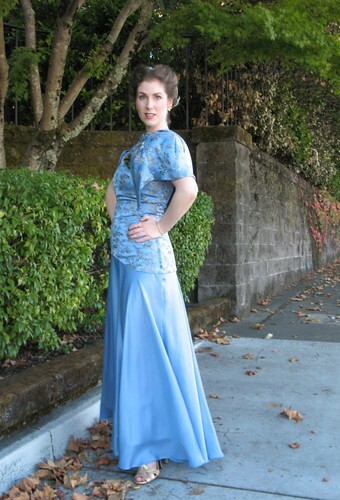 This really is a jaw-droppingly sublime dress. You did an utterly and completely awesome job on it. Thank you very much for taking us along throughout the whole sewing process and amazing evening out with you. Thank you for sharing everything you created! I logged on every morning to read the latest updates. The clutch bag is much bigger than I thought it was, a sensible size for all things essential! 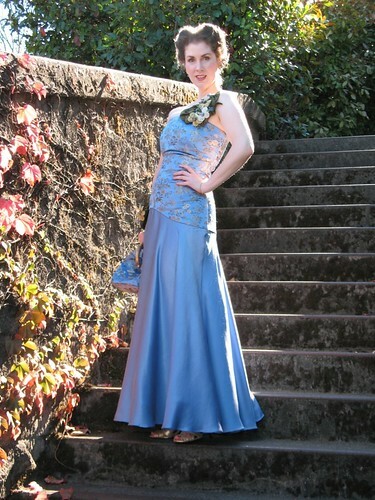 The dress is amazing, the attention to detail awesome and the final result stunning. You look fabulous in it, every hour spent was worth it. Wow this dress is amazing! I love the colour and the caplet and you really look stunning!